From the depths of the Lewes Sunday League in 2010 to promotion to the Southern Combination Premier; the top tier of County League football in just nine years. That is the summary of the footballing fairytale of Langney Wanderers. The club was founded by chairman Steve and Tracey Saunders and after two years applied for membership of the East Sussex League, gaining promotion from the Premier Division at the first attempt, winning 17 of their 18 matches. After finishing the following season champions of the Sussex County League Division Three, Wanderers would have been promoted once again if their Shinewater Lane ground had floodlights. However, after another successful campaign in Division Three during the 2014-15 season saw them finish third, promotion was secured after planning permission for floodlights was approved. 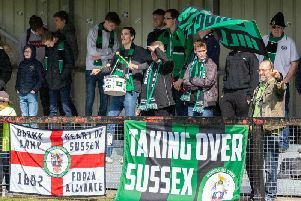 In the summer of 2015, the Sussex County League reformed and became the Southern Combination, with Division Two becoming Division One. The following 2016-17 season saw Langney ground share with Eastbourne United at the Oval due to problems with the pitch at Shinewater Lane. Wanderers finished their second season at this level a respectable eighth and tasted cup success by winning the Division One Cup, beating Southwick 3-0 in the final. This season saw Langney find another new home in the shape of National League South Eastbourne Borough’s Priory Lane and their 3G all weather pitch. The groundshare has proved a fruitful one for Langney with a near perfect home record in the league providing the basis for their promotion push that was achieved two weeks ago with five games to spare. However, it has not been consistent plain sailing throughout Wanderers nine-year existence. A poor start to the 2016-17 Division One campaign saw them fifth from bottom and without a win. Chairman Steve Saunders (Tibbs) turned to Andy Goodchild and the club have never looked back. “Tibbs rung me up after they lost 9-1 to Steyning and asked for my help,” explains Goodchild. Goodchild explains that the current 2017-18 season’s objectives were based on the consecutive victories and cup success the season prior. “The goal was simply to gain promotion,” said Goodchild. Goodchild clearly has a wonderful relationship with the Wanderers hierarchy and couldn’t speak highly enough of his employers. “Tibbs and Tracey run the club and the amount of work they put in is truly admirable,” said Goodchild. “They started nine years ago, and it really is a fairy-tale.They have put their hearts, souls and a lot of finance into the club and they live and breathe Langney. It is the same ambition and determination shown by chairman Saunders that led to Langney securing Priory Lane as their joint home. Saunders originally planned to develop Shinewater Lane but quickly realised the ground would never meet the grading requirements and so decided to chance his arm with neighbours Eastbourne Borough. The Sports immediate response was positive and the clubs ironed out the details. Goodchild explains how his side are essentially bridging the gap that exists with Borough having no Under-23 or reserve team. “Jamie Howell (Borough manager) has given me a couple of players when I have needed it like Billy Crittenden and I am trying to develop one of my young lads, Gary Ingram through to Borough,” said Goodchild. The Wanderers boss is under no illusion as to how difficult life in the Southern Combination Premier will be next season but is confident his recent signings combined with a few more additions in the summer and keeping the bulk of his current squad can make Langney competetive once again next season. One player that Goodchild can count on next season is current top scorer Wayne Wilkinson. Wilkinson has bagged 28 goals so far this term and has already committed to another season with the club.